The Record™ crankset with integrated bottom bracket is the most technologically advanced version of the Ultra-Torque™ system. The oversize axle system with outer cups is combined with a carbon fibre structure which is completely hollow internally Not only is the main crank arm hollow, but also the small arms supporting the chainrings of the RH crank. We have called this technology Ultra-Hollow™ Structure and it is created using a unique method, developed by Campagnolo®, which combines extremely high-pressure moulding, capable of compacting the fibres of the structure like no other process, with hollowing of the structure, removing material from areas which have no structural function. The result is that oversize cranks are obtained, characterized by lightness, strength, rigidity and long life without precedents. 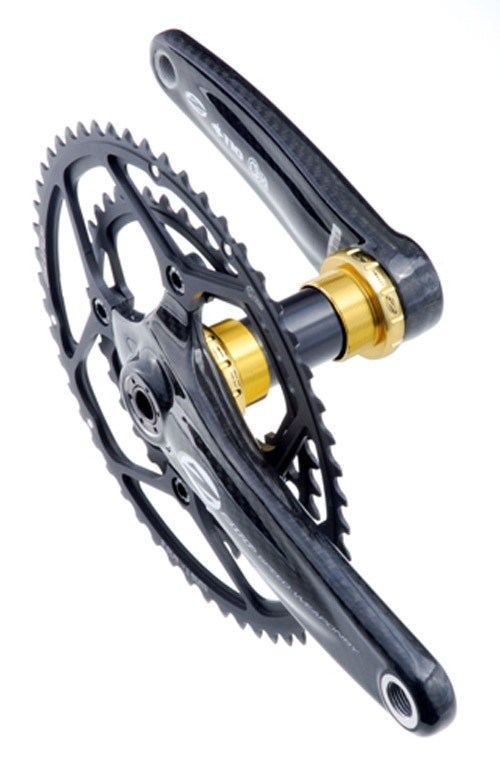 Unlike cranks of the previous generation, which had a metal insert for interfacing with the bottom bracket axle, Ultra Torque™ carbon cranks have an oversize steel axle fixed directly to the carbon structure of the crank, giving a considerable weight saving. Despite the use of outer cups, the Q factor and the lateral dimensions in the bottom bracket area remain substantially unchanged and do not require the athlete to adopt biomechanically incorrect pedalling positions. 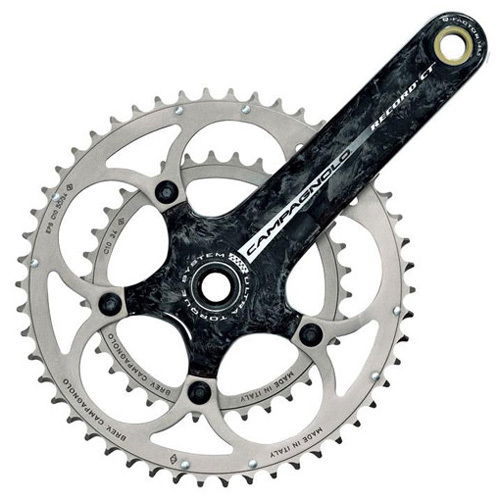 The Record™ Carbon crankset is available both in a compact version (CT) and a standard one which also includes lengths 177.5 mm and 180 mm. 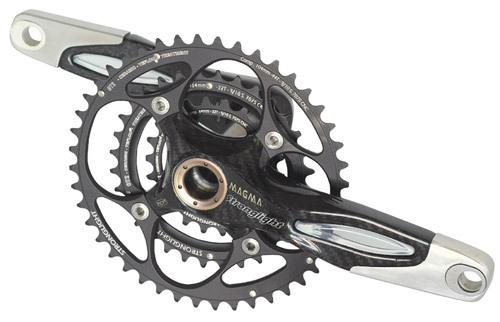 The VumaQuad is a 4-arm compact crank fits the emerging 30mm BB standard, has a 30.0mm spindle and 30mm bearings. This crank set is 33% stiffer than the next lightest product on the market and passed the new increased CEN fatigue test at the new standard of 1800 Newtons. We offer both compact 50/34 and standard 53/39 extra stiff chain rings fitted to a 110mm bolt circle and attached with “NoNuts” system to reduce weight and increase overall crank stiffness. The smaller chain ring is threaded, so we use a larger diameter bolt to increase thread engagement, reduce weight and Stiffen the chain ring – crank arm interface. There is a ceramic bearing option (with gold bearing cups + $200) comprising ABEC 7 races and Grade 2 balls. Our standard (gray bearing cups) option with ABEC 5 races and Grade 10 steel balls is already 2.5 times rounder than the industry norm. The VumaQuad is compatible with all 68mm wide bottom brackets with either 1.37″ X 24T English threads or 36mm X 24T Italian threads. The VumaQuad is designed to work with only the VumaQuad bottom bracket bearing cups. continue reading "ZIPP VumaQuad 30mm Crank with Ceramic Bearings from Wiggle.co.uk"
The new top model of Stronglight! X-Wing offers maximum performance in competition with a very futuristic design. With integrated Activ Link titanium axle (TA6V) in the right crank for an excellent ratio of stiffness – dynamics – weight! “In mold” magnet (inside the hollow carbon structure) for pedaling rate computer. The high-quality, CNC machined aluminium chainrings feature CT² technology (Ceramic top layer impregnated with Teflon). Adding Ceramic ensures a harder surface, longer life and resistance to scratching. The Teflon reduces the chain’s friction and makes for diminished noise factor, lower over all friction and less need for lubrication. Note: Picture shows Compact version. New Magma Carbon MTB crankset with integrated Activ Link stainless steel axle in the right crank for an excellent ratio of stiffness – dynamics – weight! Elastomere inserts for maximum pedaling comfort and less vibrations. Polished casings protect the crank arms at unexpected and hard tail strikes. 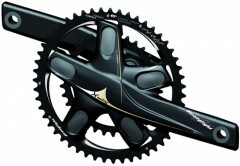 The innovative ALS (Adjust Length System) offers the opportunity to change the crank length from 170mm to 175mm.